Tasmerelda was my first fantasy poem, and was the beginning idea for this website. This fantasy poem creates a feeling much like the beginning parts of the classic tale of Sleeping Beauty except in my poem, it is an evil magician who prevails. Tasmerelda tells the story of a beautiful princess kept prisoner in her castle by an Evil Magician who casts a spell on Tasmerelda and her entire kingdom — all pawns in this classic play of Evil against Good. A knight, clothed all in white (ie: “good”) is lured to the castle, and tries to rescue Tasmerelda, but fails, overcome by the powers of the Evil Magician — just as the evil wizard planned from the very beginning. The poem ends in a play on words, by asking two questions in one, whether the story was simply a myth or fairy tale, or was it a legend based on historic reality? (ie: “Was Tasmerelda”) And if it really did happen — it also asks if Tasmerelda will ever be rescued from her fate? (ie: “ever be?”) If you’d like to know the answer to that, read the sequel fantasy poem, The Legend of Evermore. If you’d like to see a great video by a friend of mine, David Cate of Orlandowebdevelopment.com, that features the Tasmerelda fantasy poem, and also some of the background images of my other poems, please click the link below. 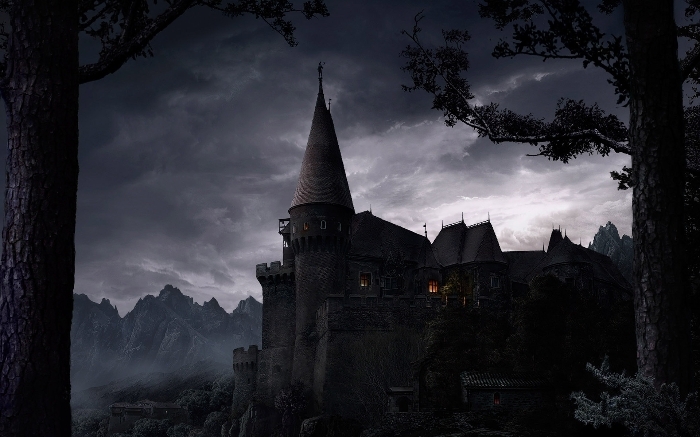 As to the awesome background image of the castle – it’s off the web years ago, and trying to find the source. It’s exactly as I envision the castle in my fantasy poem.